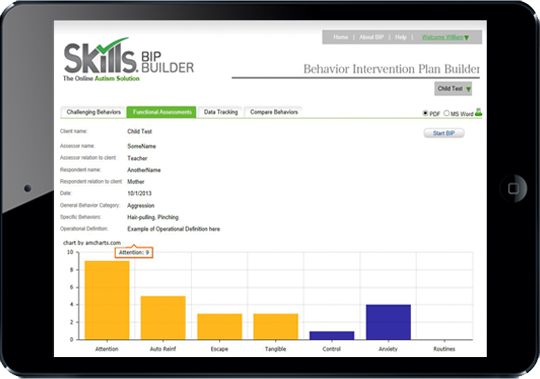 The Skills® BIP Builder aids clinicians and teachers in choosing treatment components for behavior intervention plans. Based on scientifically-proven and least-intrusive procedures, the program makes plans more function based, more evidence based, and more effective. evidence-based practices and emphasizes least-intrusive procedures. Select antecedent modifications, replacement behaviors, and consequence manipulations. In a randomized controlled study, use of the Skills® BIP Builder substantially improved the quality of behavior intervention plans (Tarbox et al., 2013).